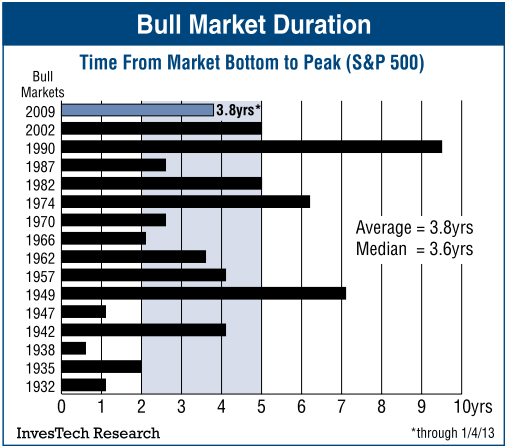 The following infographic by InvesTech Research (and sourced on The Big Picture) neatly shows the duration of all bull markets dating back to 1932. The current bull market is running to form, having just surpassed the median length of a bull market. It's simple chart which takes the last swing low and projects forward in time; for example, the current bull market is timed from the March 2009 low. What's interesting is how few bull markets fail inside a year. It's a lot easier to trade a bull market if after a year the market has failed to take out the past year's low, suggesting something longer than just a relief bounce in a bear market. Only in 1932 and 1942 would you have been buying into a top had you waited a year after the low to buy. 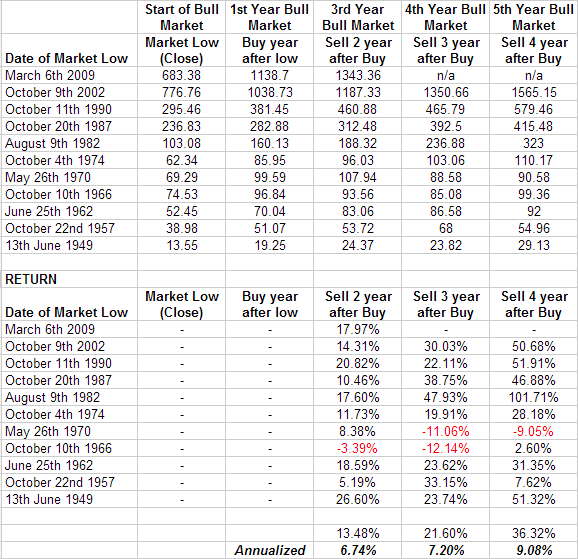 How would have fared had you bought a year after a low, and sold two years later (i.e. three years into a bull market), or three years later and four years later (when most bull markets typically end)? 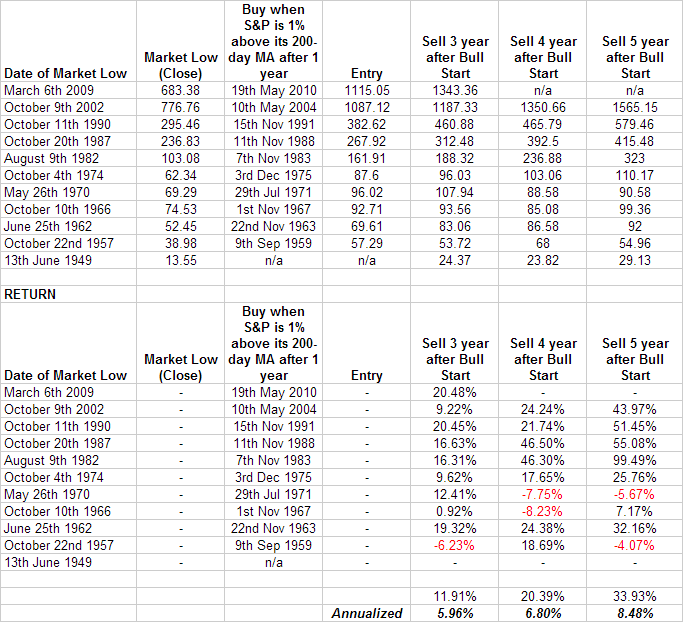 The table below highlights the returns based on available data (back to 1950). The first obvious point to make is that a large portion of the potential return is lost in the first year of 'confirming' the bull market, but this cost-of-business is necessary to limit the risk of a bear "fake out". The second point is the omission of the pre-1950 data, when bull market performance was at its weakest. This would likely have had an adverse impact on the returns reported. Overall, returns were positive, with the best return coming from a holding period of 4 years after the purchase. This offered an annualized return of 9%. Only in 1957, 1966 and 1970 were the returns sub-standard or negative. Tailoring the entry a little more didn't bring an increase in Returns. For example, buying the S&P when it was within 1% of its 200-day MA, but only after a year has passed from the bull market low, lowered the Annualized return. However, this form of entry is well suited to a Zignals Alert, which can notify of such opportunities (when the SPY is within 1% of its 200-day MA) as they occur. By setting an alert, the trader doesn't miss such opportunities as they arise, rather than attempting to trade an arbitary system, such as buying exactly 1 year after a bull market low. 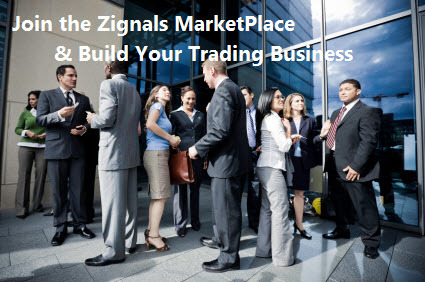 Build your own trading system and sell it in our MarketPlace to earn real cash. Read what others are saying about Zignals on Investimonials.com.